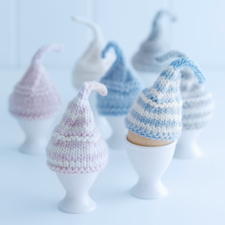 Hand-knit wool hats to keep boiled eggs warm before serving? Completely unnecessary, but too cute to pass up! I hope I get these for my birthday or Christmas this year. Soft-boiled eggs were one of my favorite breakfast foods growing up and were so easy to make. Check them out at Donna Hay.